-8: Each opponent loses life equal to the number of cards in his or her graveyard. The kitten's out of the clutch. 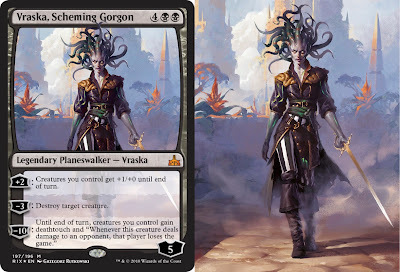 We do love to speculate a bit as to what the next Magic: the Gathering set may hold, not really from a collector's financial point of view, but that of furthering the Magic story and inspiration to brew the night away with imaginary cards that have not yet come to be. 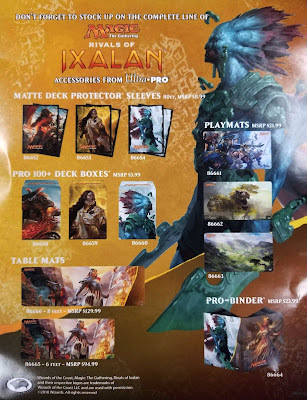 Mark Rosewater has been leaving little nuggets on Blogatog suggesting what players may expect - such as the almost obvious hint to expect a Merfolk Lord in the upcoming Rivals of Ixalan set. 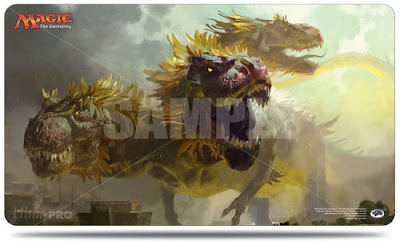 We also have previews which suggest a partial colour cycle of elder dinosaurs, and from the Creative Team at Wizards of the Coast, the chance of some named secondary characters seeing print as legendary creatures. Rivals of Ixalan Playmats for Magic - Playmats from Ultra PRO with premium fabric top to prevent damage to cards during game play. 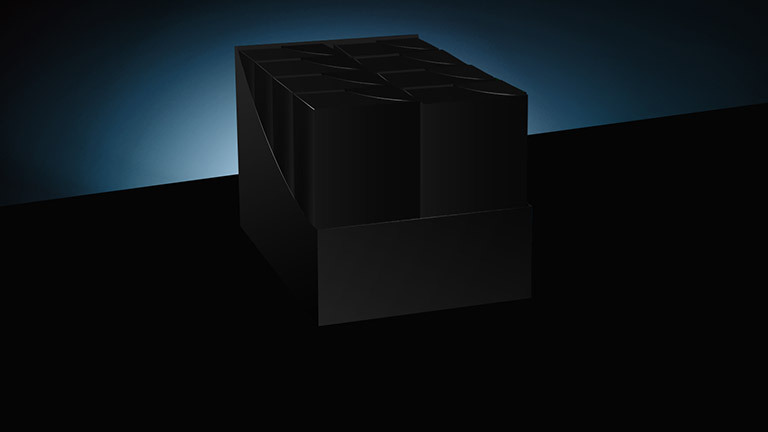 Dimensions are approximately 24" x 13-½". Rubber backing lets the playmat lay flat and prevents the mat from shifting during use. Crazy Hydra-Dinosaur - count ‘em three heads. Our friend Jay Annelli (Vorthos Jay) keenly pointed out a striking similarity to Ghidorah. 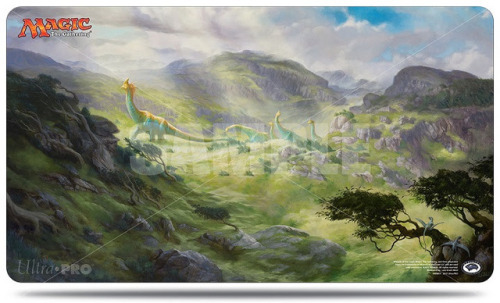 Ixalan landscape with happy dinos and of course Captain Beckett Brass leading a Brazen Coalition charge. 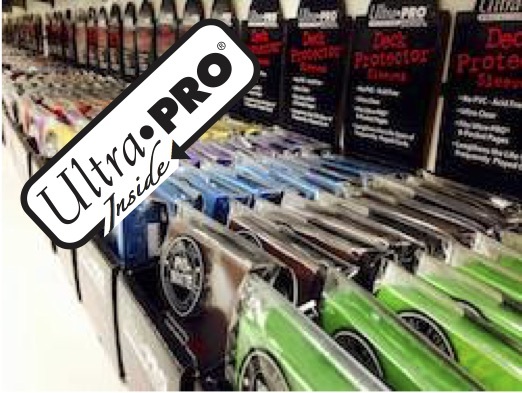 Deck Protector sleeves with matte clear front finish, for a smoother, professional shuffle feel. Sized 66mm X 91mm to store and protect standard sized cards. 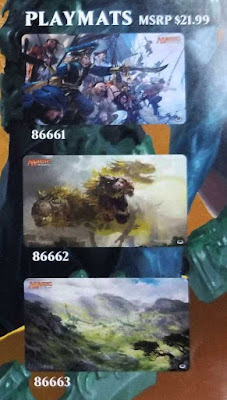 Looks to be legendary Merfolk creature (hinted to a 'Lord'), Angrath the angry Minotaur dad, and quite likely the fabled vampire Elenda (Saint Elenda, Elenda of Garrano). 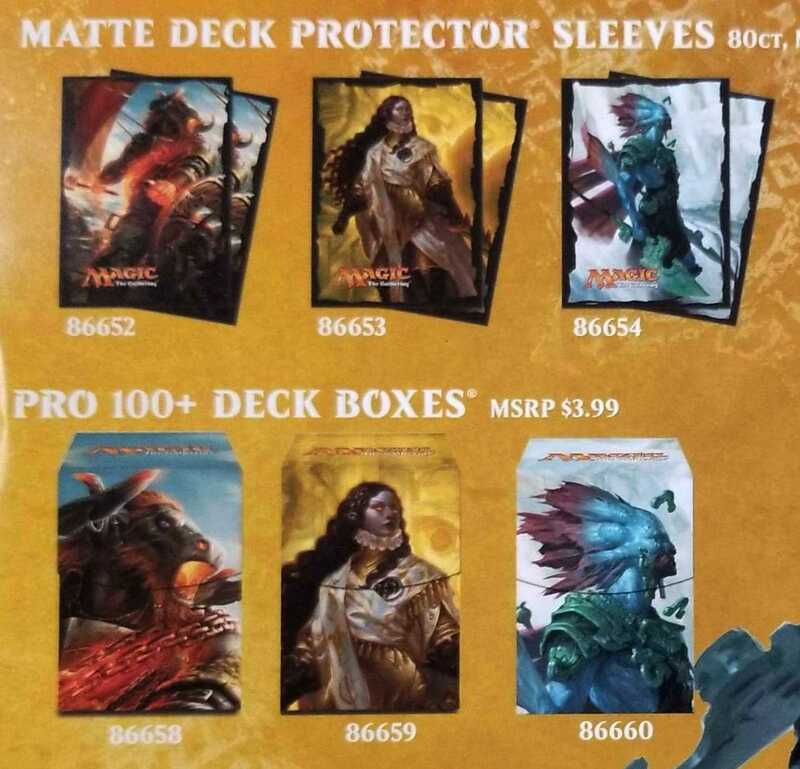 Some interesting news delivered today on the mothersite via Blake Rasmussen regarding new and retiring Magic: the Gathering products. The TL/DR summary essentially is Duel Decks will no longer be printed and that Event Decks is getting a work-over. Let's get to the details you need to know now. Duel Decks was a series of theme decks that started in 2007 with Elves vs. Goblins. These products were designed to be ready-to-play right out of the package for two gamers. 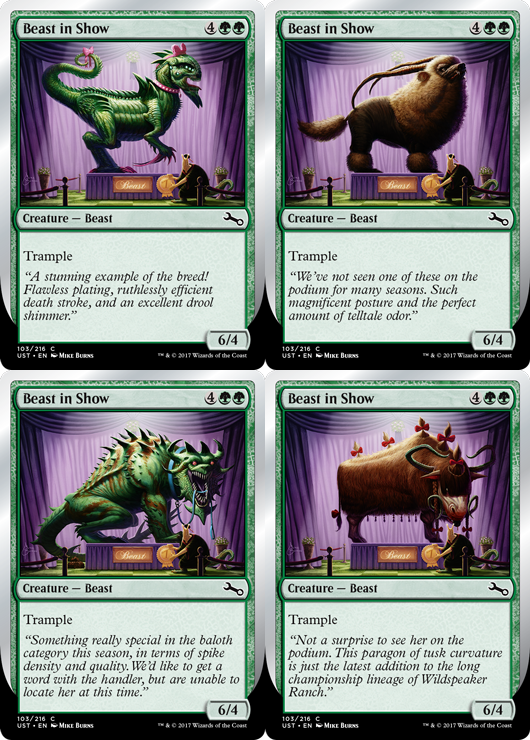 Typically each duel deck had a backstory a notable rivalry in Magic: the Gathering History expressed within the 60-card deck. In almost all cases, the two decks were rather well balanced against eachother and delivered some fun games. Impovements over the years witnessed alternate art to connectivity to soon to be released standard sets. 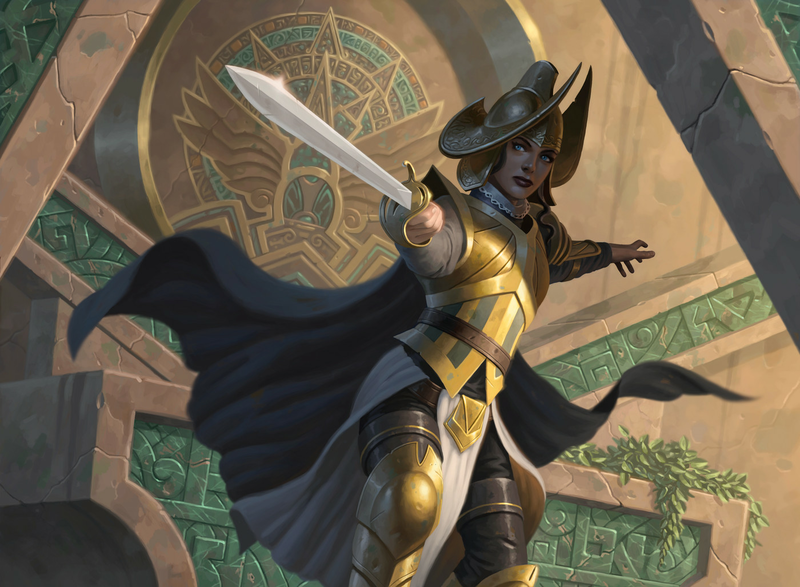 One last hurrah is on tap for April, 2018 with Duel Decks: Elves vs. Inventors, featuring a theme of nature against artifice. This final duel deck is to have two ready-to-play decks, ten tokens, two deck boxes, a strategy insert, a quick reference guide, and two Spindown life counters. 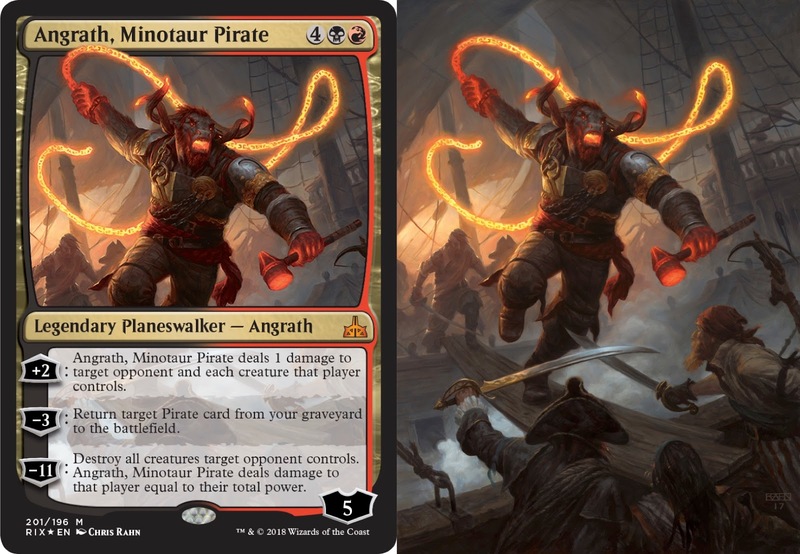 We realise that all good things to come to an end, but we are disappointed that Wizards of the Coast did not follow up on their 2008 April Fool's joke of Duel Decks: Pirates vs. Ninjas. Next up - Challenger Decks ! There was another standard legal product that had exactly the same content - the Event Deck. 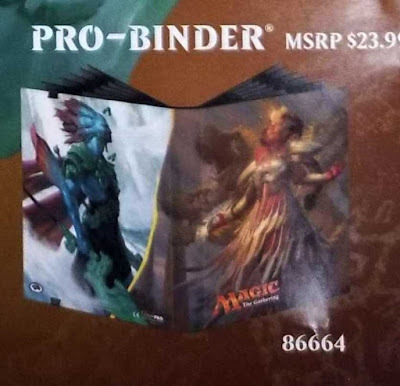 The difference here is that the Event Decks were created to "make it as easy as possible for someone to show up at Friday Night Magic and play in a tournament". The departure of the Event Deck (and 'Clack Pack') before Oath of the Gatewatch was expained by Mark Rosewater on Blogatog. 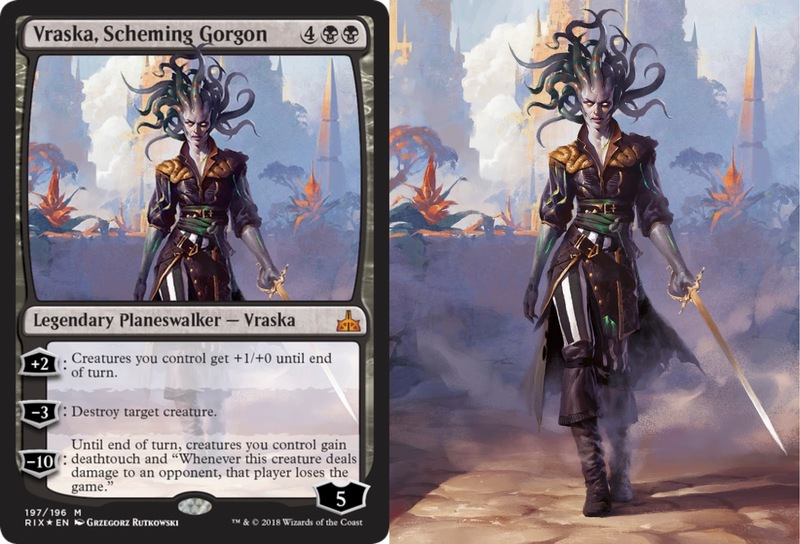 Wizards of the Coast are "constantly evaluating our product line to make the best series of products we can which means from time to time discontinuing some them". 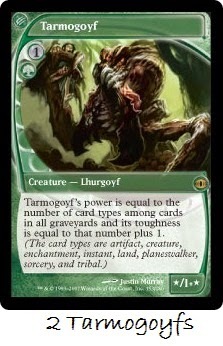 Although the Event Decks had a short run from about 2011 (Mirrodin Besieged) to 2015 (Battle for Zendikar), one of the perceived (and not necessarily correct) reasons for the less than expected reception from the gaming community was that these were simply either not powerful enough or were simply not even been close to competitive within the Friday Night Magic evironment. The messaging which may have been lost here was that the Event Deck was to be an entry product. 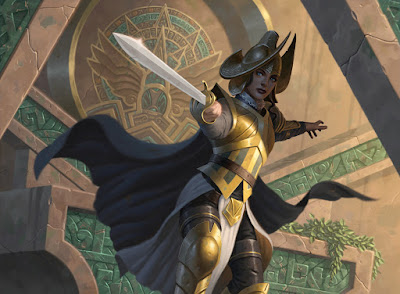 We are hopeful for the Challenger Decks expected in April 2018 for one reason - As Gavin Verhey indicated within the adjunct to Blake's article - the decklists are to be crafted much closed to the release date giving it a greater chance of success within the evolving competitive environment. 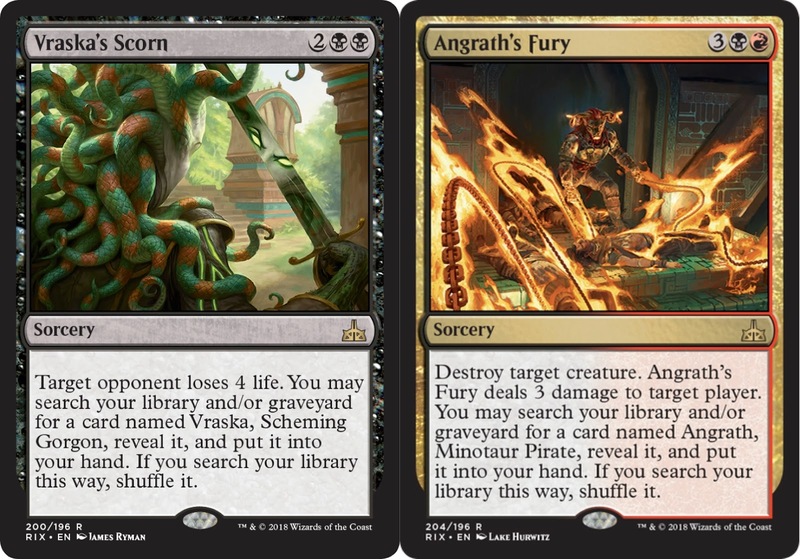 With a measure of foresight from Magic R&D, one may be able to game with this pre-constructed product for a decent period of time with minimal changes to sideboard to address developing strategies. 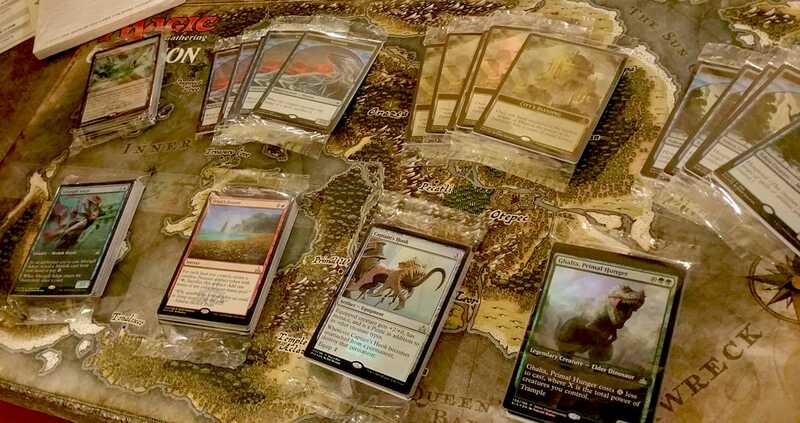 There may be only one condition which may not please Magic: the Gathering players who purchase - the price. 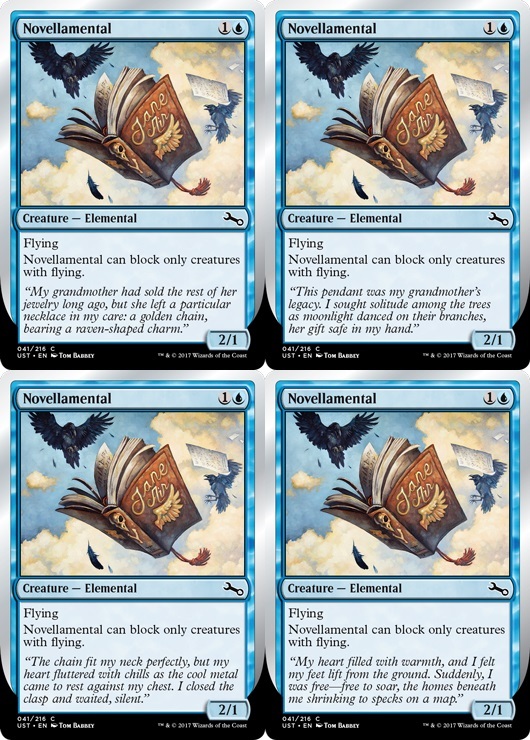 Many players may think upon the $25 for an Event Deck whereas a decent and competitive list may often be in the range of two to three hundred dollars. Obviously not always the case, but we should hope that those who lamented the lameness of entry level event decks are not vocal of the anticipated price hike to a more powerful list. Yesterday at around noon, Wil Blanks (@HairlessThoctar) shot out a tweet indicating that gaming stores had received a flyer from possibly from a gaming distribution company supplying Magic: the Gathering products advertising upcoming Rivals of Ixalan products from Ultra PRO. This was followed with another post yesterday afternoon from redditor TacticalRangers with an image of the full product offering poster. Already previewed is the images of the Minotaur (in all certainty Angrath), as well as the vampire, thought to be the legendary character Elenda of Garrano, also known as Saint Elenda (a good second guess may be that of Queen Miralda). 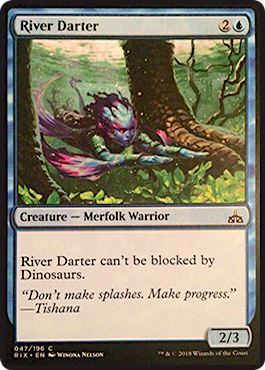 New Rivals of Ixalan art spoiler is the image of the Merfolk - possibly the Merfolk Lord which MaRo alluded to on his blog earlier. 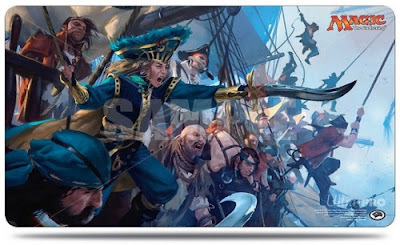 The first playmat shows what may very well be Admiral Beckett Brass leading a charge of pirates. The second most epic of images shows a three-headed dinosaur. The last image appears to be a lovely landscape on Ixalan. 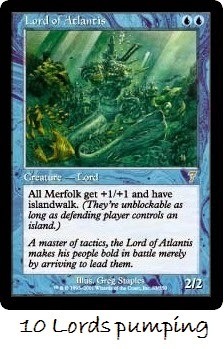 From MaRo's Tumblr we now have it that the liklihood of a Merfolk Lord in Rivals of Ixalan is pretty much a done deal. 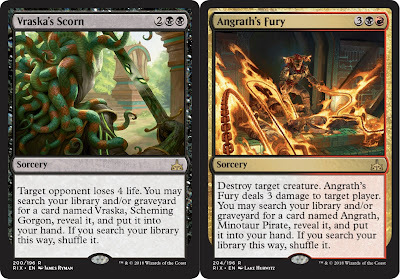 A word of caution to those Magic: that Gathering players about the so-called 'Lords' - this does not simply mean the final card will give a pump of power / toughness, but may be interpreted to be any creature to provide any benefits to creatures of the same type, or even more loosely, the player. 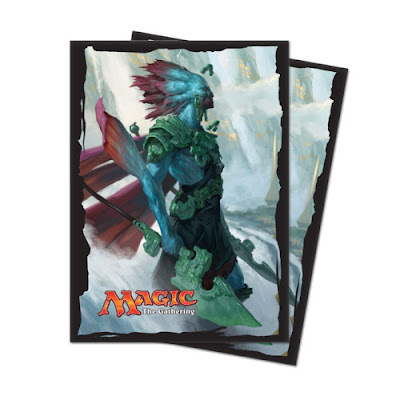 Rather excited about this as we have a blue / green standard Merfolk decklist we want to rock our FNM events after the release. 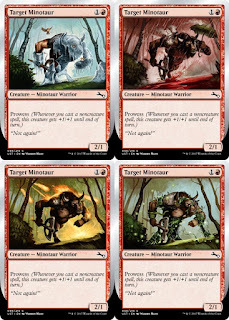 We are also pretty much garuanteed, from the Planeswalker Decks revealed that we are to expect a Vraska variant as well as a debut of Angrath (the angry Minotaur dad) as a Planeswalker card, updating the legendary card in the previous Ixalan set. Anywhoos, We should do a bit of summary of Rivals of Ixalan, more for us than you the reader, to summarise all the recent Rivals of Ixalan spoilers and previews. 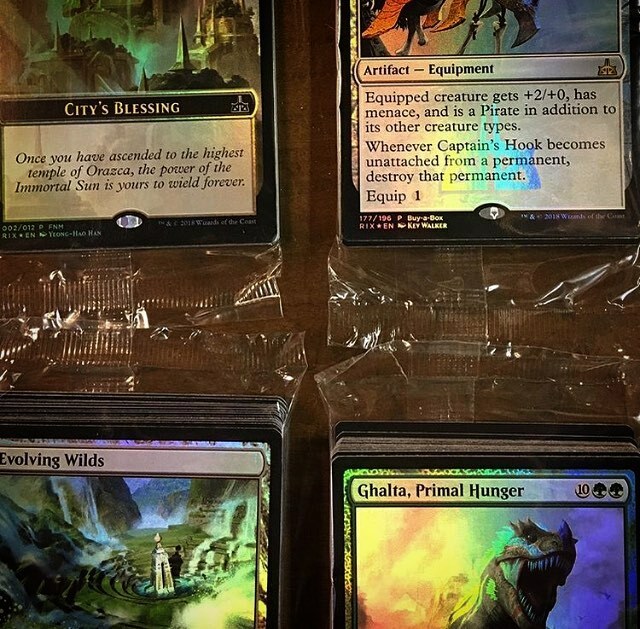 Wizards of the Coast posted the other day Rivals of Ixalan packaging images and promo cards to expect over the next while including some interesting Friday Night Magic tokens. 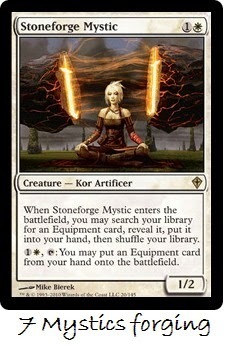 Prerelease: a stamped card that can be any rare or mythic rare from the set. City's Blessing marker // 0/1 Red Elemental with "At the beginning of youur upkeep, sacrifice this creature and return target card named Rekindling Phoenix from your graveyard to the battlefield. 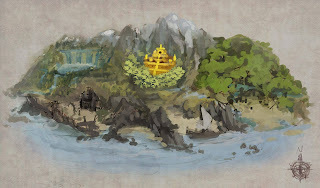 It gains haste until end of turn"
Starting January 1st when official previews begin for Rivals of Ixalan, we hope to front 'n' center, buried deep in the lore / vorthos and awesome new cards. For now, here is a tantalizing look at Orazca deep within the jungle interior of Ixalan. 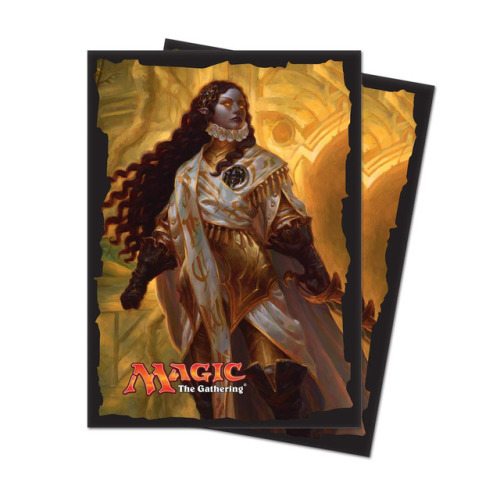 It being the 12th day of December, this had reminded us of an apropos post a few years back on December 4th, 2014 where we had laid out our Magic: the Gathering take on the jolly Christmas Carol, The Twelve Days of Christmas. 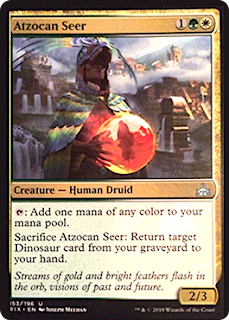 To this end, we now regurgitate that post to you, along with the estimated card value from that time. A Magic: the Gathering Christmas ! 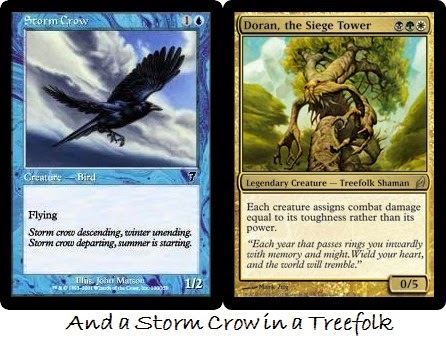 • And a Storm Crow in a Treefolk! Our playgroup was chatting the other evening about this very song when someone wondered as to the price for all of these very lovely cards. That is what we hope to estimate right now. Prices below are a rough aggregate from CCG House, MTG Mint Card, other online retailers and our own local WPN store OMG! Games here in Barrie. 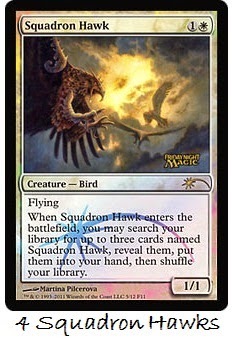 • Foil 7th Edition Storm Crow ($1 foil)in a Doran, the Siege Tower Lorwyn ($10 Foil). 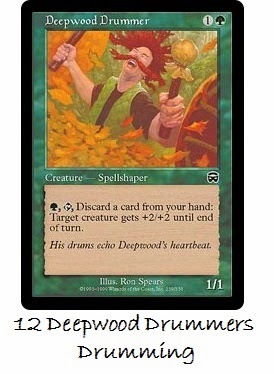 We used Doran, our fav card to rep the treefolk here. 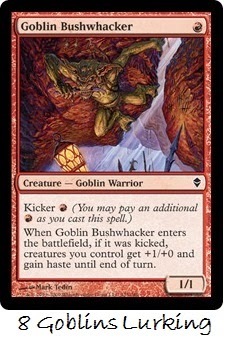 • 8x Goblin Bushwacker ($3 Zendikar foil) We used the bushwacker here as we thought it looked very 'lurky'. 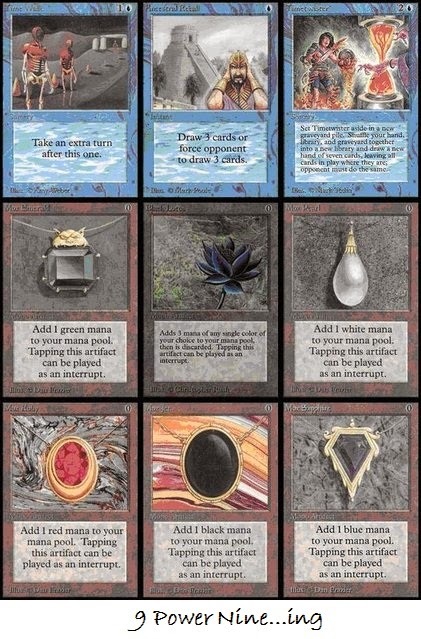 • Black Lotus ($6,750 Unlimited), Ancestral Recall ($1,700 Unlimited) Time Walk ($1,200 Unlimited), Mox Pearl ($1,200 Unlimited), Mox Sapphire ($1,600 Unlimited), Mox Jet ($1,300 Unlimited), Mox Ruby ($1,000 Unlimited), Mox Emerald ($1,100 Unlimited), and Timetwister ($650 Unlimited). Summed up, we are looking at just under $21,000 or so. 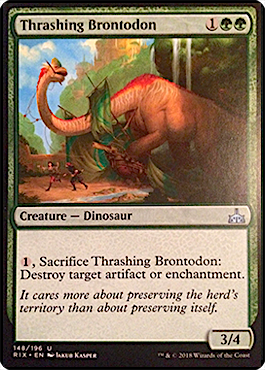 It is not immediately clear where these Rivals of Ixalan spoilers originate from, but whether it was Reddit / Imgur or Instagram, we do now have a fairly complete list of the promotional cards. Here is that summary now. Edit - Now updated with the official Wizards of the Coast article posted at this link. 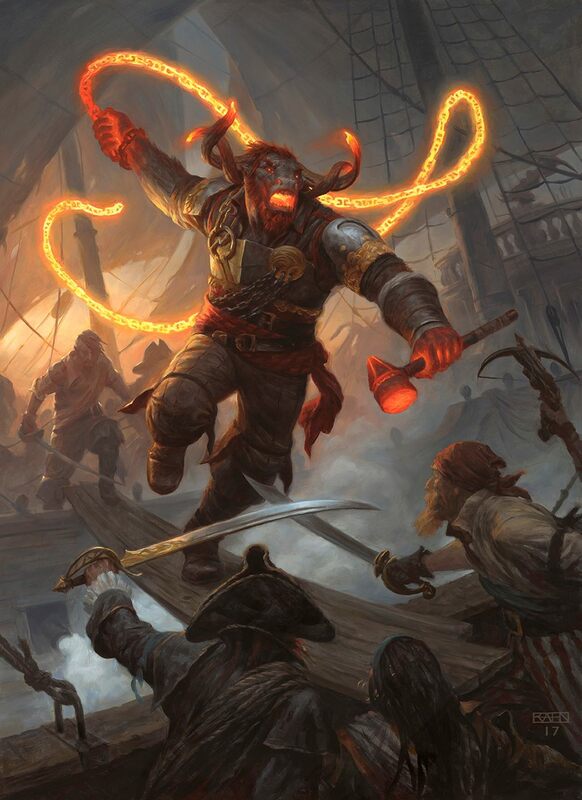 Equipped creature gets +2/+0, has menace, and is a Pirate in addition to its other creature types. Whenever Captain's Hook becomes unattached from a permanent, destroy that permanent. 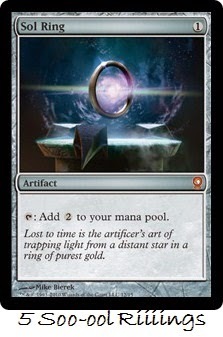 For each land you control, create a colorless Treasure artifact token with "Tap, Sacrifice this artifact: Add one mana of any color to your mana pool." Some late day news to share with you. Charlie Hall of Polygon (Vox Media) had posted some exclusive previews for the upcoming Rivals of Ixalan set (linked here). 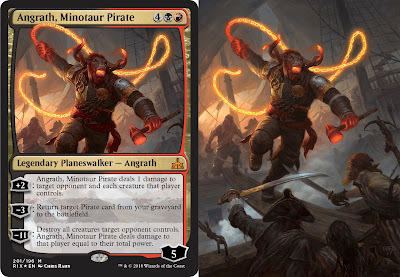 Specifically, some nine cards along with glorious artwork from the Rivals of Ixalan Planeswalker Deck products were posted. 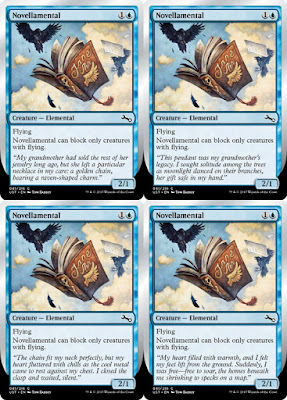 Before we get to that, we should speak about what Planeswalker decks are to those new to Magic: the Gathering. 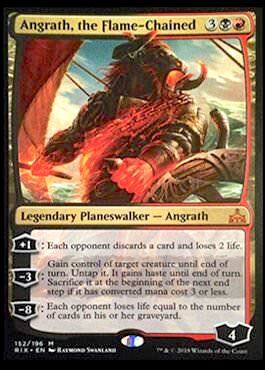 Rivals of Ixalan Planeswalker Decks releases January 19, 2018 for an MSRP of $15. 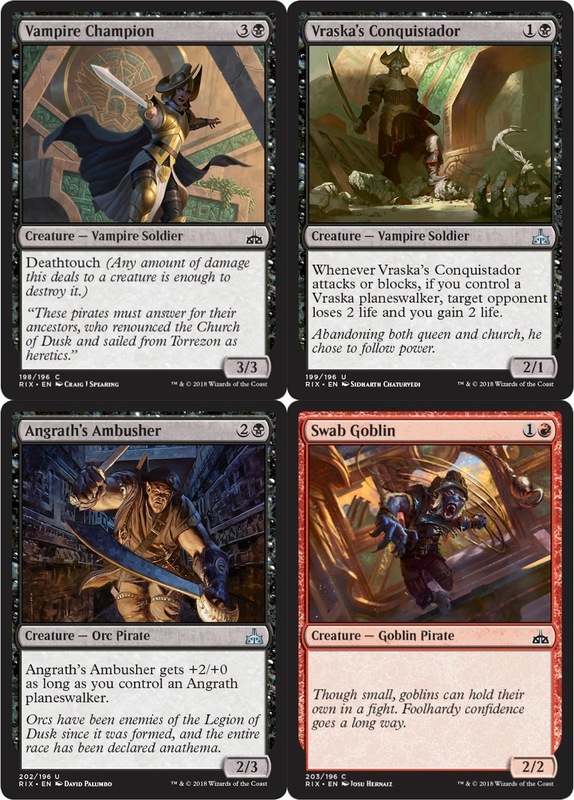 These decks acquaint players who are interested in Magic with basic strategy, the game's settings, and characters, and include a premium foil Planeswalker card. The newest (kookiest?) 'un' set, 'Unstable' is ready to be unleashed this very weekend. The full set has already been previewed, and gamers are looking forward to draft this whacky and farcical set. 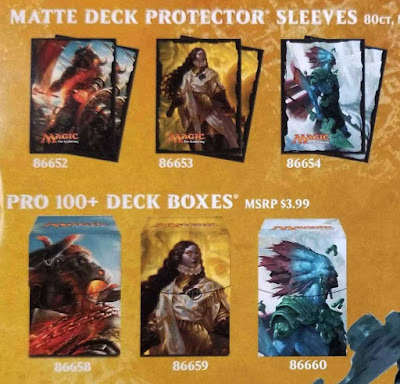 Most collectors wanting specific cards from Unstable have already pre-ordered those cards and the well-heeled player may have already likely ordered deck protectors / card boxes and playmats from Ultra PRO (like the table matt above). 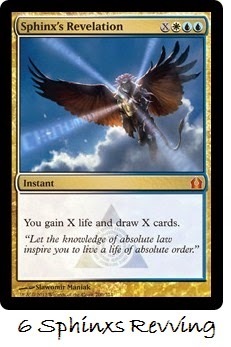 This is all very well - BUT - in a jocular jab, Wizards of the Coast did not reveal one rather important thing. 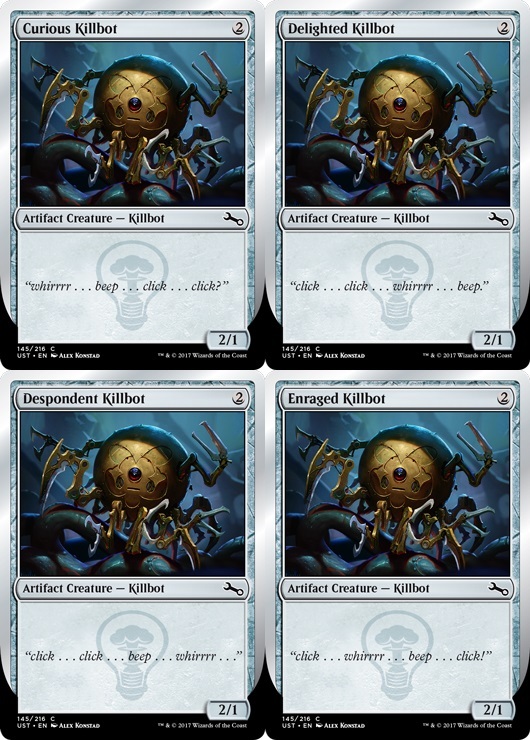 They did 'hint' at it though - blah, bleh, expect 216-ish cards. We should have paid more attention. As retailers started breaking down boxes and cracking packs for single sales, it began to emerge that there was something fishy, which may be explained in one word . . . 'VARIANTS'. 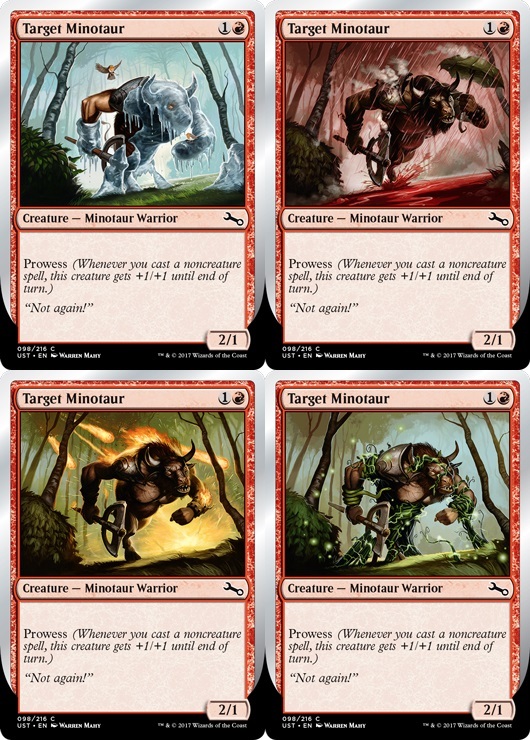 A number of cards in Unstable are printed with multiple variants. 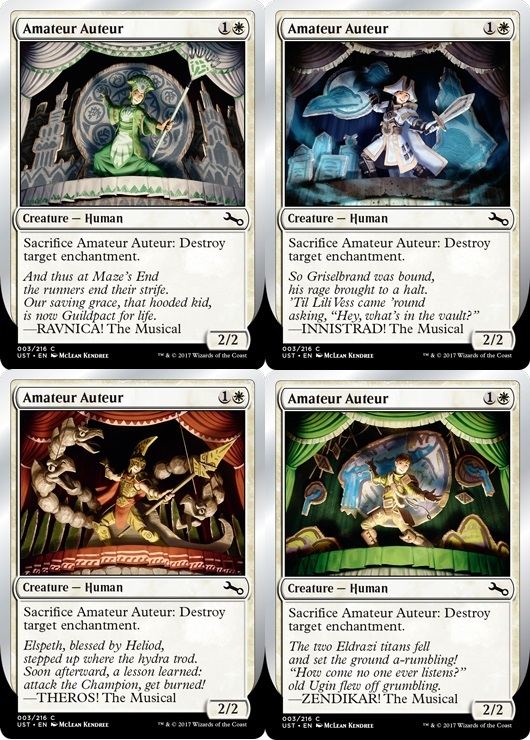 These variants can differ on rules text, flavour text, art and watermark. 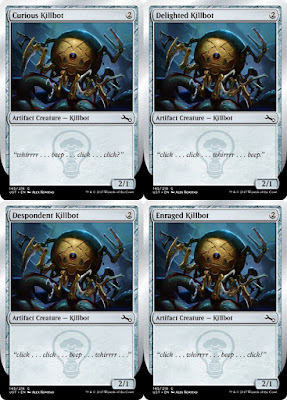 • Killbot (name and flavour text) Curious, Delighted, Despondent, and Enraged Killbot. In some sad news, iconic artist Wayne England had been commissioned to create a version of Very Cryptic Command but had unfortunately passed away before completing it. 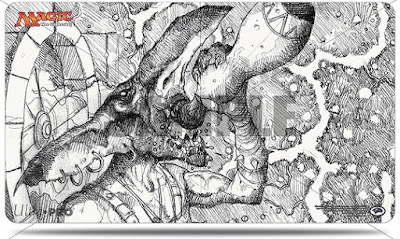 Ultra PRO is offering this uncompleted work on a line of deck protectors, deck boxes and playmats and donating the net proceeds from the sage to the family's chosen charity, the British Heart Foundation. 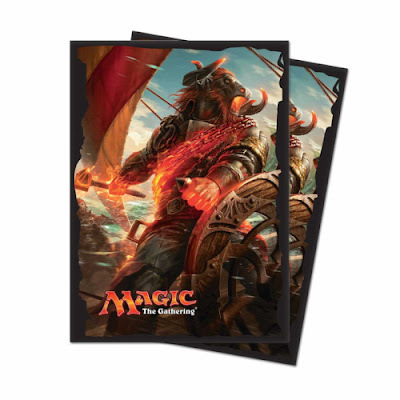 In summary, a very happy and welcome surprise for gamers cracking packs in this weekend's draft events around the world. There may be additions / corrections to the above list over the next few days, so stay tuned. Collectors and online retailers however may not be as happy however given that preorders have already been preordered and whatnot. Here is what StarCityGames had pushed out earlier today to communicate with their customers.